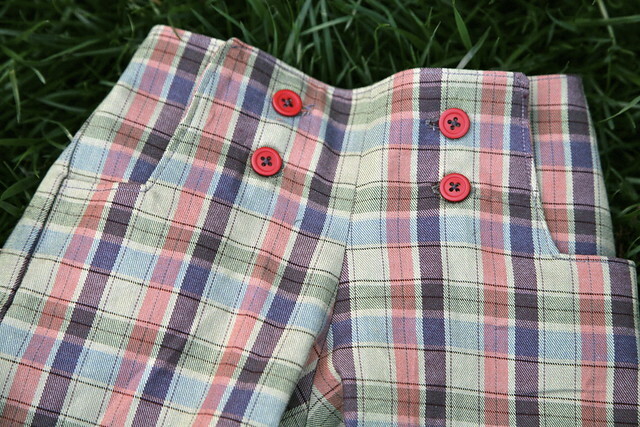 Inder Loves Folk Art: Plaid Sailboat Pants. 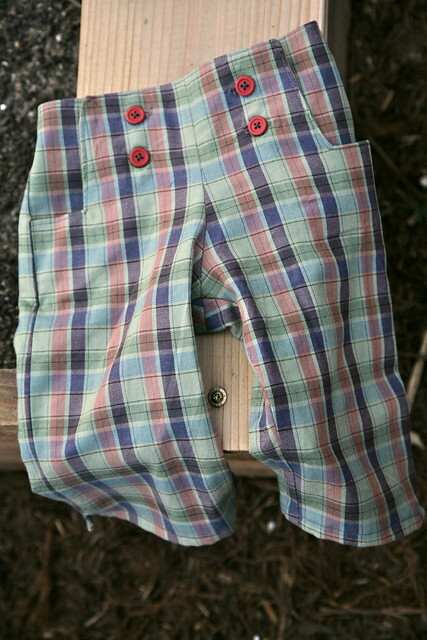 Just stopping in briefly to share my latest sewing project: a pair of plaid Sailboat Pants for my friend E.'s daughter. E. and her family will be visiting the Bay Area from Denver, Colorado later this week, and I hope the see them this weekend! I think these are pretty rockin' in plaid. These did not go together quite as easily as the last pair. First there was the cutting. I convinced myself I was matching the plaids pretty well, but when I went to sew the pants together, it was pretty obvious that I had no idea what I was talking about. I think it's high time I sat down with some sewing books and read up on matching stripes and plaids. In the meantime, we'll just pretend that "plaid matching" is not something we care about, shall we? Works for me. But I persevered, and the result was a pretty smashing pair of plaid pants, if I may say so myself. Of course I used red buttons. Red buttons make everything better. Next up: Something for meeeeeeeeeeee! I'm super excited. Here's a hint. Red buttons DO make everything better. I agree. It is one of those rare but important constants in life. Thank you! I don't think almost three year olds appreciate the work that goes into handmade clothing (although I know my almost three year old does appreciate the whirring machinery involved! ), but I did hear from her mom that she really likes plaid, so hopefully they'll be a hit! smashing indeed! love, love love. What? It looks like the plaid lines up perfectly to me! I was actually marveling at it before I read your post! Just don't look at the back, where I am thinking that the elasticized bottom will cover up a lot of issues! Seriously, I got the horizontal axis lined up okaaaaaaay, but the vertical is not even close. Luckily, not too big a thing. I would like to figure out how to do it properly some day. Oh my goodness, these are gorgeous! LOVE!! Hey! The little miss LOVED the pants. They are her pants of choice whenever they are clean. And she LOVES the red buttons, on which she practices her buttoning skills. And she especially LOVES that her good friend Inder made them. It's adorable that she practices on the buttons, which are actually kind of pointless and could easily be made just decorative (since the elastic is enough to get the pants on and off). I'm glad they serve some use! Cheers.